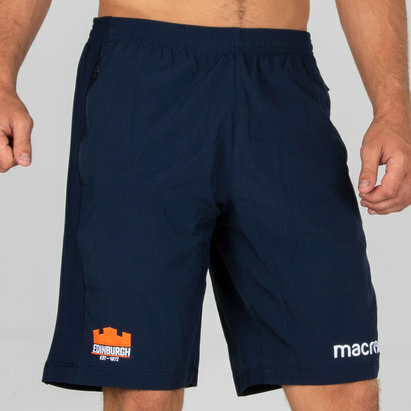 As one of only two professional rugby teams in Scotland make sure that you show you're a fan of the team from the capital rather than the team from the most populous city in this Edinburgh 18/19 Home Rugby Shorts from Macron. Edinburgh from the Guinness Pro 14 became the only Scottish club to reach a major European final when they squared up to Gloucester Rugby in the Europea Rugby Challange Cup back in 2015. Now, this season they look set to be one of the teams to watch. Made from a strong 100% polyester base, these shorts are built to survive challenging playing conditions and won't rip easily. Designed to match the home shirt these shorts come in a navy colour. The Macron logo is on the right leg with the club’s rebranded logo - which represents the turrets of Edinburgh castle, the volcanic origins of the city and the year of the city’s first game – on the left. These shorts have orange detailing down the sides.